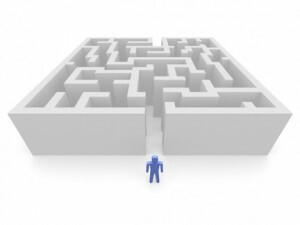 Divorce proceedings can seem like a maze. Divorces between husbands and wives in Washington State are governed by RCW 26.09. Domestic partnerships are dissolved under RCW 26.60. Both husbands/wives and domestic partners must obtain a “decree of dissolution” from the Superior Court in order to terminate the legal relationship they entered into upon marriage or registration. 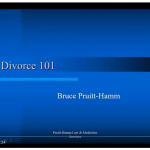 The general process of divorce in Washington is covered in our short 6-minute video, “Divorce 101”. 1) Initial Phase; 2) Discovery and Negotiation; and 3) Trial/Settlement. The process takes a minimum of 91 days (required waiting period) to several years (depending on a number of factors), but usually is finished within about a year. The Initial Phase starts with the decision to divorce (or learning of your partner’s decision) and ends when temporary orders are entered by the court, typically after a temporary orders hearing that occurs 1 to 3 weeks after the initial divorce pleadings are filed. In about 95% of the cases, this hearing is the only time the parties appear before a judge, as only about 5% of all divorce cases end in a full trial. The second phase of Negotiation and Discovery follows the initial phase. Discovery is the term for legally authorized forms of obtaining information that you don’t have – through mechanisms such as interrogatories, requests for production of documents, and depositions. Attorneys have special authority to issue subpoenas and engage in some forms of discovery not available readily to litigants without attorneys. Once you have enough information you may “make an offer of settlement” and the parties engage in ongoing negotiation in hopes of reaching that settlement. In many counties, including King County, local court rules require the parties to use some form of alternative dispute resolution, such as mediation, before they can proceed to trial. Mediation usually results in an agreement. The final phase is Trial or Settlement. There are only 2 ways to end the divorce process: either you find some way to reach an agreement with your spouse/partner on the terms of your divorce, or you take the issues between you to a judge in a trial – with witnesses, exhibits, evidence and formal decisions made by the judge. Typically, only about 5% of the cases filed actually end up going to trial and the majority of the remainder reach a settlement directly or through mediation.